The Legacy Gold Package is the Ticket Price of $82.37 for the Grand Canyon Skywalk. This has caused some confusion over time. You CANNOT just buy a Ticket to the Grand Canyon Skywalk ONLY. You MUST buy the Legacy Gold Package to enter the Skywalk -OR- it MUST be included in the Tour you book from Las Vegas. In addition to admission, visitors may purchase professional photographs of their visit to the Skywalk in the gift shop. Personal cameras -OR- Cell Phones are NOT allowed on the Skywalk itself; along with other personal property, they must be stored in a locker before entering the Skywalk. I Googled a Map of the Driving directions on how to drive to Grand Canyon Skywalk from Las Vegas. Google is estimating a 2 hour and 20 minute drive. It is approximately 125 Miles or 201 Kilometers to the Skywalk. You simply take Highway 95 out of Vegas, which becomes Highway 93 just before Boulder City, Nevada, this Highway then takes you through Boulder City and over the Colorado River Bridge to Arizona. Just a few miles or kilometers before the Bridge, you can drive down to a Parking Lot with access to the pedestrian walkway on the Bridge…for views of Hoover Dam. Allow an extra half hour or more for this stop. Unfortunately, you CANNOT see Hoover Dam while driving across the Colorado River Bridge in a passenger vehicle…the cement dividers are too high. There are Gas Stations with Restrooms along the the way to the Skywalk. Now, 73 miles or 117 Kilometers after leaving Vegas on this Highway, make sure you turn left onto the Pearce Ferry Road by the big Grand Canyon Skywalk sign. This will take you in a North Easterly direction towards the Skywalk through Dolan Springs. Next, be looking for the Diamond Bar Road sign in about 31 miles or 50 Kilometers, where you will turn right to the Skywalk. You then take the Diamond Bar Road for about 21 miles or 34 Kilometers to the Grand Canyon West and Skywalk Tour Center. Park in the designated parking area when you arrive and enter the Tour Center. You can Check-In and purchase your Tour Package here. You can also Purchase a Tour Package Online at GrandCanyonWest.com. You DO NOT need to make Reservations to visit Grand Canyon West and the Skywalk. No private vehicles are allowed beyond the designated parking area and Tour Center. ALL of the Tour Packages are operated by the Hualapai Tribe at Grand Canyon West. There are two main packages that visitors purchase when visiting Grand Canyon West and the Skywalk. 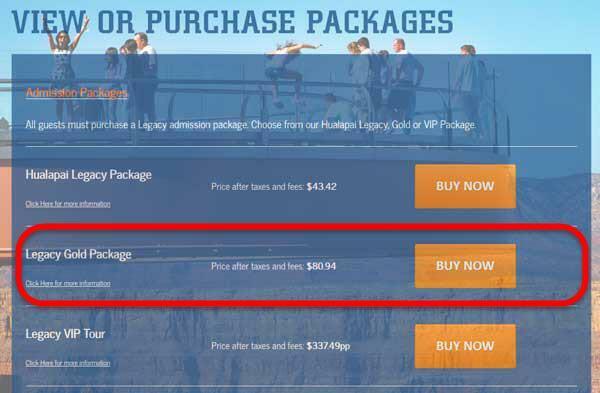 The Hualapai Legacy Package and the Legacy Gold Package. The Hualapai Legacy Package DOES NOT include the Skywalk Ticket, nor Lunch. Since most visitors want to take a walk on the Skywalk, you need to purchase the Legacy Gold Package that includes a Skywalk Ticket and Lunch. This is the most popular Tour Package. If you are looking for a more exclusive tour, then you might consider the Legacy VIP Tour. Each Tour Package includes a stop at Eagle Point where the Grand Canyon Skywalk is located, Guano Point with spectacular views, and the Hualapai Ranch with Western hospitality and entertainment. I would recommend you get an early start no matter what time of the year you plan on visiting the Grand Canyon Skywalk. Also, in the heat of summer, the earlier you get there, the more comfortable it is. Grand Canyon West is normally 5 to 10 degree’s cooler than Las Vegas…so, it can still be pretty warm out there in the summer. Remember hydration and drink lots of liquids. Sun care is always important in the Southwest, so remember to bring a hat and sunscreen. Now, if you decide you DO NOT want to drive yourself out to the Skywalk, there are tour options by Motorcoach, Airplane, and Helicopter which will pick you up and drop you off at your Hotel in Las Vegas. You can leave all the navigation worries to someone else by taking a look at your Tour Options below or on GrandCanyon.com. Come visit the Grand Canyon Skywalk and experience Grand Canyon West. It’s one of the newest attractions at Grand Canyon…and it’s close to Las Vegas.